King Felipe VI of Spain, Queen Letizia of Spain attended the meeting of the Board of Patronage of the Prado Museum at Museo del Prado on February 16, 2016 in Madrid. Белый костюм! больше нельзя - терпеть до 2 марта. Тогда будет сформировано правительство. I can understand you.. But I have heard Mette Marit, Kate and Maxima are tall too. Yes, that's true. Tall woman can wear high heels next to a tall man. How many people here do you think understand Russian? Well, I sure don't understand Russian; but just out of curiosity I copied the Russian comment into an online translator: "White suit! It can no longer be - endure until 2 March. Then the government will be formed." Can't decipher the intended meaning in the comment, however. Nice to see different languages in these comments, I'm learning new phrases - foreign languages are fascinating. How rude! I would think all are welcome here regardless of language. How rude Anon 7.27! Again I say this page has some of the meanest comments ever. If I was the administration many would neverget posted. I know several who have left because this just isn't fun. It'seems a cat fight every single day. I agree with you. This site was nice, but now there are very unpleasant people. If all of us started to post in our native language, then comments here would end up very multilingual (I'm Estonian and its clear that people here are from France, Germany, Sweden, Russia, etc). So please excuse my grammar mistakes but I prefer to comment in English (so more people could understand and wouldn't have to use translator; some meanings can get lost in translation). I do not think that comments here are so mean and hateful. People say what they think of someone's hairstyles, makeup, outfits, shoes, etc. and its THEIR feelings. We don't have to agree on everything. But perhaps I have not read those comments (I only follow Swedish and Spanish royals)? 10:37, I could not agree more. We should speak English since the majority understands it. The exception are French people, no offense, but I have heard they speak nothing but French. Or American people who think the world must be speak english like them and become fat. Not ALL American people. Don't stereotype Anon 2.07. I also speak French and Italian and some very bad Spanglish. And I am not FAT! One could argue that when people are in trouble they sure like to see fat Americans speaking English. But that's right Americans are intolerable. How soon people forget. I am American and English is not only spoken in America. There are many English speaking countries in the World. Besides that NOT everyone is fat in America. If you read you would know that people are getting fatter and that is global problem , not only in America. Making generalizations about an entire group of people is either stupid or immature. @2/16 @7:27 Your question has merit. According to Miss Manners and the classywoman.blogspot.com, etiquette requires that you speak in the language of your host. The blog is in English. If you can read it then respond in the language the host uses. Google translate if you must. Obviously it is true what I said about French. Why can't you respond in English if everyone else can. Why can't you open your mind!!!!!! Zašto bi mi trebali prevoditelja ako ti govoriš engleski? Zašto ne ostaviti ljude na miru, svađati Lassie? 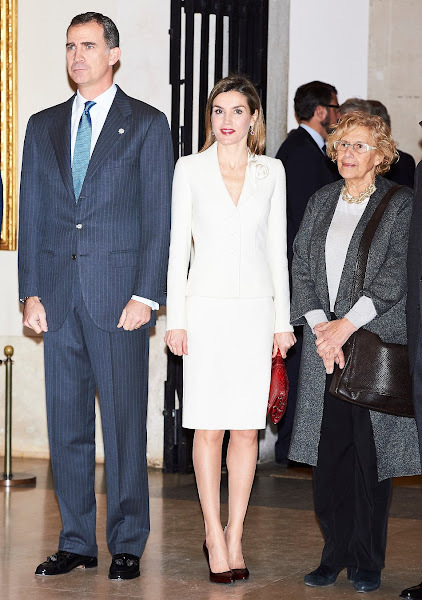 Belle, belle et lumineuse Reine Letizia dans son impeccable tailleur blanc et manteau rouge. Quel couple toujours amoreux et complice! Letizia doesn't measure 1,77 m! Il she had 10 centimeters of heels, it make 1,87 m.
Cassandre, Anonymous Feb 16 at 7/06 PM didn't say Letizia measures 1,77m. She was talking about herself. By the way, I really admire Leti's walking style. She really can walk gracefully in high heels. I saw the clips that Queen Rania visited Spain last time. Queen Rania surely can't walk in high heels. She shall avoid that. 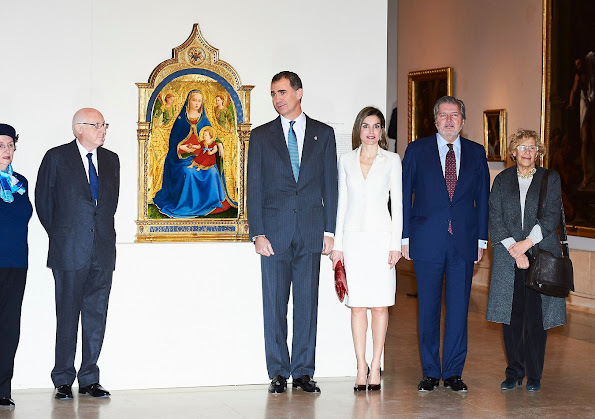 Letizia looks great as usual. I am curious why she let the belt to the coat just hang in the back instead of using it or leaving it at home. Maybe she just untied it on the way inside to take it off. Thank you anon 8:21 pm for the translation. That is how you wear open coat, you do not leave belt at home .It would have been much more elegant if she wore coat over her shoulders . The way Queen Maxima do very often! Letizia also carries times the coat over her shoulders. Maxima not have to give her any lesson in style. Beautiful! Just beautiful! I love the way this couple look at each other. There is a real chemistry between them. Jag lär mig mer engelska och franska =I learn a lot more English and French. Tack! Thank you! Creo que con un top debajo le quedaría mejor. No la veo especialmente favorecida. I really like Letizia's red coat. Its so eyecatching and pretty. Her white costume looks also very professional. Also love her hair - her tresses look so shiny and sleek. 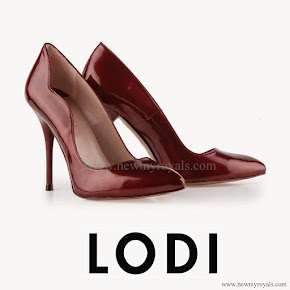 I would have some serious trouble walking on so high heels but she has no trouble. Although heels so high...not good for your legs! White is not her color.